If you can take the Carolina heat, get out of the kitchen and take your meal outdoors! It may be warm outside, but with good company and a fresh menu the temperature might even be forgotten. A slow-setting, lazy summer sun and gentle warm breezes are at the core of alfresco dining. Your senses are heightened. Bird song and happy chatter become your soundscape. The smell of the crostini coming out of the oven, the flavor of citrus in the summer salad, the feel of the condensation beading on your cool glass. All engage your senses; all play an essential part in alfresco. I’m here to help you plan yours this summer! Use a melon baller to make 1 cup of watermelon balls, store in a container, and add to the freezer for ice cubes. Add 8 cups of cut up watermelon and one cup of strawberries to blender. Blend until smooth and pour through a large sieve into a pitcher. Add the wine, lime juice and slices, blueberries, lemon balm, and spindrift. Chill for a minimum of 3 to 4 hours before serving. Add frozen watermelon balls to glasses and pour sangria over top. Using 8 limes squeeze the juice into a bowl. Mince the garlic, lightly chop cilantro and add both to the bowl. Julienne the red onion and rinse under cold water several times to reduce the overpowering flavor. In a separate bowl add avocado, mash, and squeeze the extra lime juice in the bowl, and mix. Set aside. Cut fish into 1/2” pieces and add to lime juice bowl. Add in salt/pepper and evaporated milk and begin stirring. Add the red onions and continue stirring until opaque. Dish out the mashed avocado as the base, add the slices of red bell pepper, and finish by topping off the dish with the citrus flavored Corvina and onions. Serve immediately. Preheat oven to 350∞F. Mix all ingredients together for tart by combining butter, honey, salt, eggs, and beat until smooth. Gradually add in the flour and whisk until smooth. Once you have a doughy consistency, form one large ball, cover with saran wrap, and place in the refrigerator for 20 minutes. Place ball on a floured surface and roll out flat to cover an 11” tart pan. Press the dough into the pan. Bake in the oven for 20 minutes or until lightly golden. Once finished, remove crust from the pan and set aside for filling. While the crust is cooking, boil the rice in 1 ½ cups of water for 20 minutes. Once most of the water has evaporated, add bananas, coconut milk, vanilla, salt, and maple syrup. Cook for another 8 to10 minutes or until mixture reaches a thick consistency. Pour your coconut rice mix into the crust and spread evenly. 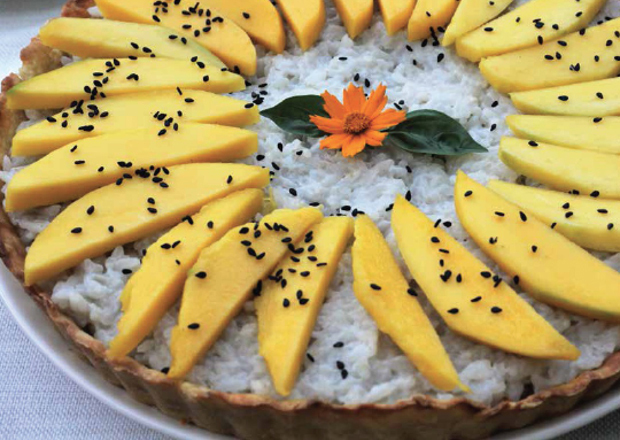 Cut up your mango slices and place them on the top of the tart. Sprinkle with sesame seeds and serve warm! Preheat oven to 375∞F. Core and chop raddichio, slice the radishes, and shred the bibb lettuce. Set aside. Toss the grapes in the olive oil and thyme. Place the grapes on a baking sheet and cook in the oven for 15 minutes or until they begin to split. Peel the jicama and cut into small 2” strips. Combine the radicchio, bibb lettuce, white beans, walnuts, and grapes. Add all ingredients for dressing into a blender and mix until smooth. Pour over the salad and toss. Chill before serving. Preheat oven to 350∞F. Cut baguette into 1” slices. Lightly brush ghee onto baguette pieces and arrange on a baking sheet. Cut the peaches into thinly sliced wedges and arrange on the other side of baking sheet. This may require two separate baking sheets. Cook in the oven for 8 minutes or until the baguettes are lightly toasted. Carefully spread a light layer of goat cheese onto the baguettes. Add a peach slice on top of the crostini and add a basil microgreen to garnish. Set aside. Add pomegranate seeds to blender and blend until smooth. Pour the juice through a strainer into a pot. Add lemon juice, honey, and mix. Heat the juice up and lower the heat to a simmer until thickened, about 5 or 6 minutes. Use a spoon to pour over each individual slice. Add water to a large pot, sprinkle some salt into the water and bring to a simmer. Add bacon to baking sheet and cook in oven at 400∞F for approximately 10 to 12 minutes or until desired crunchiness. Choose your best collard leaves out of your bunch and wash thoroughly with cool water. Trim the spine of the leaf with a sharp knife so that the stem is about as flat as the rest of the leaf. One at a time, simmer each leaf in the hot water for about 30 seconds on each side. Use tongs to turn leaf to do both sides. Once finished, remove from water and pat dry. In another pot bring about 3 to 4 cups of water to a boil. Add farro and bring heat down to a simmer. Cook for 25 to 30 minutes. Once farro is soft, drain and add Gruyere cheese. M until cheese is melted into the farro. Crumble the cooked bacon into small pieces and add to farro along with the salt. Mix well. Using one leaf, add a generous amount of the farro mixture into the middle of the leaf, fold the sides over the mix and roll tightly, like you would a burrito. Add all ingredients for vinaigrette and mix well with a spoon or whisk. Cut wraps in half for serving if desired and use vinaigrette to dip.